When we need to get something out or put something into our shed when it’s dark, it’s always more of a hassle than it should be. It starts off with trying to find a flashlight, then only having one hand to carry stuff out and put it in the right spot is not easy. Solution: put some lights in the shed! 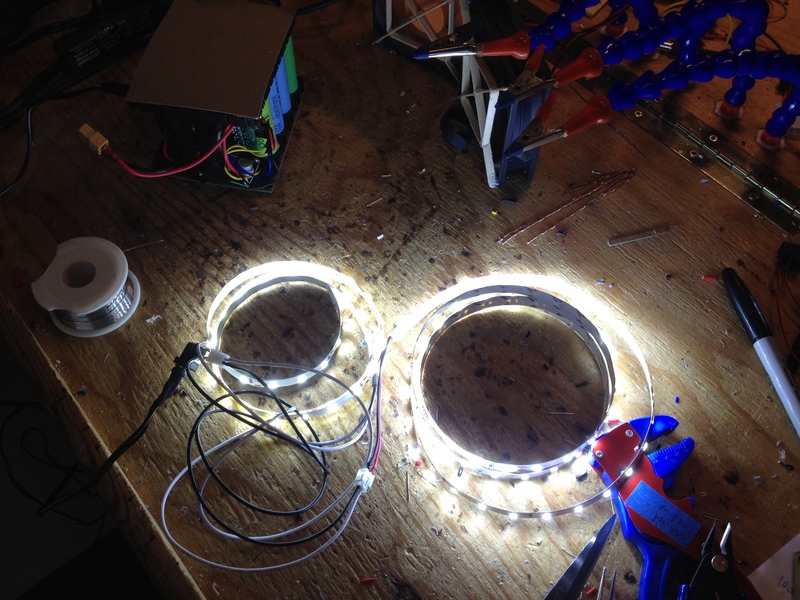 Let’s start off with the easiest part of this project, the LED lighting itself. 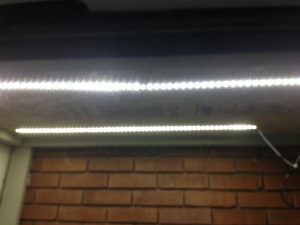 I used some very simple 12V LED strips with 5630 or 5730 LEDs for the lighting. 2 strips of them worked well because the shed is fairly deep, and allows much more even lighting. In total, there are 2m of LED strips. Current draw is roughly around 1.5A. Now to find a suitable way to power them. As this is outside, running AC power to it and using a small power supply was impractical. 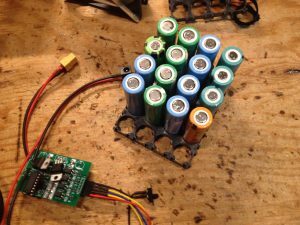 I have lots of 18650 lithium-ion batteries lying around, waiting for me to do something with them (a power wall is in the works right now), so I made a 4S 4P pack inside a 4×5 cell holder to allow for extra room to hold a BMS circuit and DC-DC buck converter to get 12V for the LEDs from the battery pack’s fully charged 16.8V. 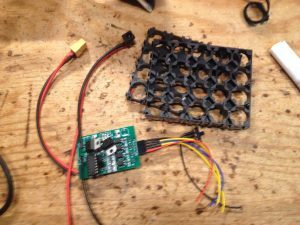 I chose 4S because I wanted to use the BMS circuit that I designed (more details coming soon) to prevent over-discharging the batteries. 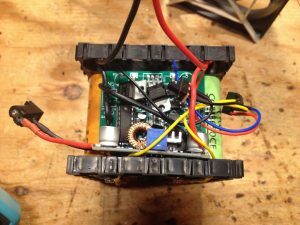 The BMS will cut all power going to and from the batteries if the voltage of any cell goes under 3.0V (accomplished with XC61C low voltage detection ICs). 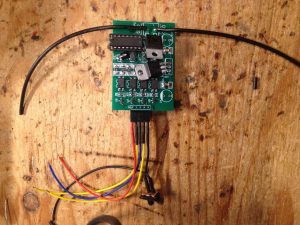 The buck converter I used is a 5A buck converter that has lots of headroom to drive the LEDs. I set the voltage to around 10.8V so that the LEDs are more efficient – less voltage drop across the series resistors, and thus less power lost to heat in those resistors. Some of these LED strips have been known to get fairly warm, so undervolting them is a good trick to keep them cool and prolong their lifetime. Mounting everything to the shed took some screws, some scraps of wood, and some 3D printed clips. The adhesive on the LED strips did not stick to the wooden shed, so I designed some LED strip clips that I also used to tidy up the cables. 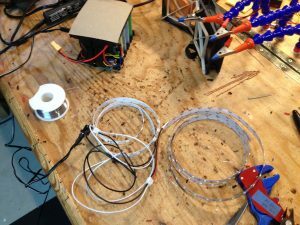 The files are available on thingiverse here. I might eventually add a PIR motion sensor and RTC to this setup to make it turn on as you approach, but not during the daytime. One problem that will come up with this is the cold weather in the winter. Discharging the batteries over in -30 degrees Celsius temperature is not good for them – it will reduce capacity, and increase the internal resistance, resulting in a lower operating time and lower possible discharge rates. These batteries are not getting pushed to their limits at all, but I’m not too sure if I want them being used out in the cold. At the very least, they will be charged more often and kept inside as much as possible. I might make 2 more to switch out so that each battery spends as little time outside as possible.